While many users need the functionality of a database management system like MariaDB, they may not feel comfortable interacting with the system solely from the MariaDB prompt. 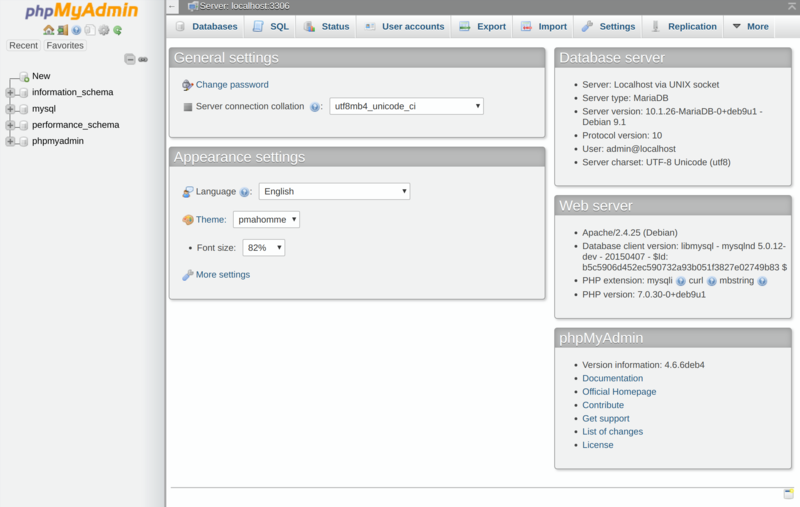 phpMyAdmin was created so that users can interact with MariaDB through a web interface. In this guide, we’ll discuss how to install and secure phpMyAdmin so that you can safely use it to manage your databases on a Debian 9 system. First, we’ll assume that your server has a non-root user with sudo privileges, as well as a firewall configured with ufw, as described in the initial server setup guide for Debian 9. We’re also going to assume that you’ve completed a LAMP (Linux, Apache, MariaDB, and PHP) installation on your Debian 9 server. If you’ve not yet done this, follow our guide on installing a LAMP stack on Debian 9 to set this up. For these reasons, and because it is a widely-deployed PHP application which is frequently targeted for attack, you should never run phpMyAdmin on remote systems over a plain HTTP connection. If you do not have an existing domain configured with an SSL/TLS certificate, you can follow this guide on securing Apache with Let’s Encrypt on Debian 9. This will require you to register a domain name, create DNS records for your server, and set up an Apache Virtual Host. To get started, we will install phpMyAdmin from the default Debian repositories. Warning: When the prompt appears, “apache2” is highlighted, but not selected. If you do not hit SPACE to select Apache, the installer will not move the necessary files during installation. Hit SPACE, TAB, and then ENTER to select Apache. Note: MariaDB is a community-developed fork of MySQL, and although the two programs are closely related, they are not completely interchangeable. While phpMyAdmin was designed specifically for managing MySQL databases and makes reference to MySQL in various dialogue boxes, rest assured that your installation of MariaDB will work correctly with phpMyAdmin. 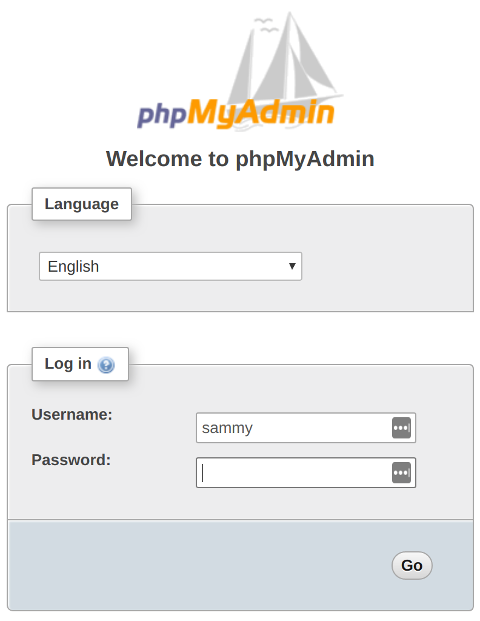 phpMyAdmin is now installed and configured. However, before you can log in and begin managing your MariaDB databases, you will need to ensure that your MariaDB users have the privileges required for interacting with the program. When you installed phpMyAdmin onto your server, it automatically created a database user called phpmyadmin which performs certain underlying processes for the program. Rather than logging in as this user with the administrative password you set during installation, it’s recommended that you log in using a different account. In new installs on Debian systems, the root MariaDB user is set to authenticate using the unix_socket plugin by default rather than with a password. This allows for some greater security and usability in many cases, but it can also complicate things when you need to allow an external program (e.g., phpMyAdmin) administrative rights through this user. Because the server uses the root account for tasks like log rotation and starting and stopping the server, it is best not to change the root account's authentication details. Since phpMyAdmin requires users to authenticate with a password, you will need to create a new MariaDB account in order to access the interface. If you haven’t created a MariaDB user, or if you have but you’d like to create another user just for the purpose of managing databases through phpMyAdmin, continue on with this section to learn how to set one up. Log in to the interface with the username and password you configured. Now that you’re able to connect and interact with phpMyAdmin, all that’s left to do is harden your system’s security to protect it from attackers. 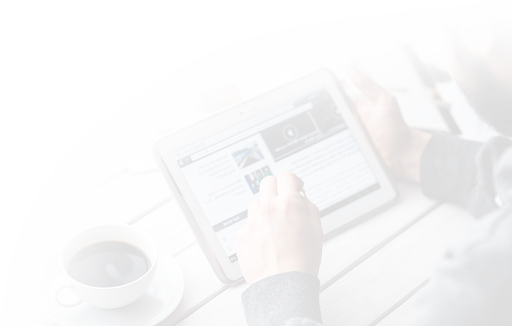 Because of its ubiquity, phpMyAdmin is a popular target for attackers, and you should take extra care to prevent unauthorized access. One of the easiest ways of doing this is to place a gateway in front of the entire application by using Apache's built-in .htaccess authentication and authorization functionalities. To do this, you must first enable the use of .htaccess file overrides by editing your Apache configuration file. Now that you have enabled .htaccess use for your application, you need to create one to actually implement some security. AuthType Basic: This line specifies the authentication type that you are implementing. This type will implement password authentication using a password file. AuthName: This sets the message for the authentication dialog box. You should keep this generic so that unauthorized users won't gain any information about what is being protected. After entering the Apache authentication, you'll be taken to the regular phpMyAdmin authentication page to enter your MariaDB credentials. This setup adds an additional layer of security, which is desirable since phpMyAdmin has suffered from vulnerabilities in the past. You should now have phpMyAdmin configured and ready to use on your Debian 9 server. Using this interface, you can easily create databases, users, tables, etc., and perform the usual operations like deleting and modifying structures and data.